“Cities need to start planning now to radically re-engineer their infrastructure to cope with much larger populations than they currently support,” concludes a new report released last week by Forum for the Future, a U.K.-based sustainable development organization. How will people travel in the cities of the future? How will billions of city-dwellers access what they need without putting intolerable strains on the planet? How can we plan now for more sustainable ways of life in a radically different world? The report responds to major trends of urbanization and population growth: By 2040 two in three people will live in cities, and the world’s urban population will grow from 3.5 billion to 5.6 billion. The number of “megacities” – urban areas with more than 10 million people – will also continue to explode, mainly in Asia, Latin America and Africa. Based on feedback from interviews, workshops and peer reviews, the report outlines six possible solutions for sustainable urban mobility, or, more specifically, to help city-dwellers access the people, good services and information they need. The report also offers four different scenarios, based on energy use and governance, of how the world might look in 2040. (In addition to their written descriptions, the scenarios are portrayed as short video animations, bringing the concepts to life.) Finally, the report offers a general outline of how to lead a workshop in your city to identify challenges, opportunities, and potential solutions to prepare for a rapidly urbanizing world. 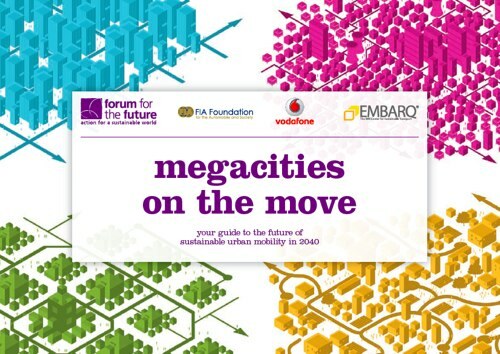 The information is meant to serve as a guide to help city governments, urban planners and transport providers think about how to move towards a more sustainable future. 1. Integrate, integrate, integrate. Cities need to consider transport, urban planning, business, public services, energy and food supply as part of the same integrated system. They should offer people choice and easy connections. 2. Make the poor a priority. Urban mobility systems must ensure that goods, services and job opportunities are open to all. 3. Go beyond the car. Cities need to be designed for people, not cars, and promote alternative forms of transport. 4. Switch on to IT networks. Information technology can create more efficient vehicles, better integrated transport systems, and can offer online and telepresence solutions which avoid the need for travel altogether. 5. Refuel our vehicles. Climate change and rising prices mean we need to focus on energy efficiency and shift the way we power our vehicles from petrol to renewable, low-carbon fuel sources. 6. Change people’s behavior. Infrastructure and technology are not enough, we need to create new social norms that encourage more sustainable, low-carbon lifestyles. Many of the specific examples related to each recommendation are technology-based innovations, such as stackable electric cars, lifelike “telepresence” screens, and “collision-free” robot cars. Without a doubt, the report delivers a clear message to create a world where all cities think more carefully about how to integrate urban planning, walking and cycling, mass transit and technology to improve the quality of life for its citizens. 1. Planned-opolis. In a world of fossil fuels and expensive energy, the only solution is tightly planned and controlled urban transport. 2. Sprawl-ville. The city is dominated by fossil fuel-powered cars. The elite still gets around, but most urban dwellers face poor transport infrastructure. 3. Renew-abad. The world has turned to alternative energy and high-tech, clean, well-planned transport helps everyone get around. 4. Communi-city. The world has turned to alternative energy, and transport is highly personalised, with a huge variety of transport modes competing for road space. In Mumbai and Istanbul, EMBARQ helped organized and facilitate two-day “futures workshops” to identify key challenges and opportunities in the local context. The report offers some guidelines for how other cities and organizations can host their own workshops to develop long-term solutions for sustainable urban mobility, in response to the four possible scenarios. In Istanbul, participants of a workshop said that raising awareness about climate change and the need for sustainable mobility was the most important next step to get people to change their behavior, so they came up with a strategy that included multi-stakeholder partnerships, pilot demonstration projects, educational programming, capacity-building and training. “It was a thought-provoking exercise that made us realize there is an urgent need for change,” says Sibel Bulay, director for the Center for Sustainable Transport in Turkey (SUM-Türkiye), a member of the EMBARQ Network. Another workshop held in Mumbai revealed similar opportunities for change. “Many of the scenario responses highlighted the need for immediate action to shift to less energy intensive transport modes,” said Madhav Pai, the director of the Center for Sustainable Transport in India (CST-India), who helped organized Mumbai’s workshop participants created a high-level action plan to fulfill their aspirations for a “localized, livable city” that’s “run for everyone.” These solutions included localized urban planning, with a focus on things like mixed-use development and flexible working environments that allowed people to be productive in their own neighborhoods. Look for posts this week on TheCityFix that go more in depth on the report’s six major recommendations: integrate, make the poor a priority, go beyond the car, switch to IT networks, refuel our vehicles and change peoples’ behavior.